An archive of previous site updates from the homepage. Having had a few weeks to read and digest the universe-altering events of Fracture of Biel-Tan, I felt compelled to write a review (contains spoilers). With spring finally here, I was able to get a few things undercoated recently, which was very satisfying. The Panther, my three Wave Serpents, Fuegan, Jain Zar and Eldrad Ulthran are now ready to be painted. There are some minor updates to the Wraithknight and Lynx and I've updated my guide to magnetising Eldar vehicles too. I have also purchased some empty paint pots so that I can pre-mix the shades that I need to complete my Shadow Spectres, which will hopefully speed things up and keep the colours consistent across the squad (once I've matched them with the test model that I've already completed). I've updated the design of the website; hopefully it looks a bit more modern now and is easier to read. If you notice any problems, please e-mail me. I've just received my copy of Fracture of Biel-Tan; I still don't intend on getting any of the models (unless I can pick up a Gyrinx or two), but I am interested to read the background that has been written for this significant change in the Eldar narrative. I hope that you enjoy the new site design - more content will be forthcoming; I am working on a few bits and pieces at the moment and I hope to do some painting this year, having failed to paint anything at all in 2016! A lot of noteworthy things are changing at GW these days. In recent months they have finally started to embrace the digital age and started reconnecting with customers. They're teasing upcoming products, producing excellent painting tutorial videos, asking players for feedback on FAQs, releasing boxed sets with genuine (often substantial) discounts on the contents, and they have built a new community site too. It is a very, very welcome change in attitude and direction. They are also producing miniatures and content at a phenomenal rate and releasing oft-requested fan-favourites like Genestealer Cults, Deathwatch, Legio Custodes and Sisters of Silence. And what do you know; they're reaping the financial benefits that come with these things. It's heartening to see and I am very impressed with just how much work they've put into this, after years of stubbornly doubling-down and ignoring growing dissatisfaction from their fanbase. Eldar players are now digesting the reveal of a trio of new miniatures, which look set to herald the arrival of Ynnead in some form or another and some kind of unified Eldar aesthetic. We're also getting a new name - "Aeldari", though the original "Eldar" name is still going to exist as well. Personally, I view these narrative, aesthetic (and let's be honest, legal) changes with a bit of trepidation. I am a traditionalist (sorry, whiner, according to Robbie MacNiven) and maybe I'm just resistant to change. I can understand GW's desire to progress the background of WH40K in order to tell new stories and sell new models. I am more concerned that in a short space of time (both in the real world, and in the 40K universe) we are going to see a huge amount of stuff happen, without lingering on any of it long enough for its impact to sink in. The rise of Ynnead has been hinted at and teased for years in the Eldar background, but now Eldrad's jumped the gun, messed up and splintered the nascent god into fragments that GW can sell and players can put on their tabletops. Are we getting too much, too quickly? Major, universe-shaping events are being piled on, thick and fast. In some cases, the narrative makes no sense - Eldrad stole Crystal Seers, attempted to drain every single Craftworld infinity circuit and failed to foresee a Deathwatch incursion that ultimately ruined his (totally barmy) plan - but all of this was just described in the fluff surrounding a set of campaign missions for the Death Masque boxed game. I'm presuming it will have no effect in the game or the rules, besides acting as the narrative driving force for the arrival of Ynnead - even though this could have had massive repercussions for every Craftworld across the galaxy and should have major repercussions for Eldrad, whose actions are plainly insane. Maybe The Fracture of Biel-Tan will prove me wrong on this, but that remains to be seen. The new models are beautifully designed and are a substantial technical achievement. The Yncarne (the Avatar of Ynnead) wouldn't be possible without advanced CAD and it is an incredibly detailed model. Except, I don't like it. The majority of collectors will never be able to do the model justice; it will live and die on its painting, requiring blending and colour transitions that most of us will never manage. Compared to even the dated Avatar of Khaine, it's a small model for the physical incarnation of a god and if you take away the swirling soul effects, the design seems a bit lacking. The Visarch is a decent model, but primarily based on Dark Eldar designs (specifically an Incubi) with only token nods to Craftworld symbolism. Yvraine also appears to be primarily Dark Eldar in influence; the headdress is absurd and the enormous bustle is a bizarre choice. I do really like the Gyrinx though. In short, whilst all three models are very distinctive, I have no love for them. After waiting years for new plastic jetbikes and Wraithguard to finally arrive, it seems we have to continue to wait to see replacements for the (many) dated sculpts lingering in the Eldar range. Obviously Eldrad's redesign was a notable (very welcome) exception, so maybe these other models (The Phoenix Lords, the Avatar, Warlocks, Warp Spiders, Shining Spears and Swooping Hawks) are just waiting in the wings. Games Workshop's commitment to plastic (and the associated expense of producing the moulds) does make me worried that some of these models will never see the light of day and could even be written out of the background to save the expense of having to produce replacements. If these End Times events include a treatment of the Rhana Dandra, the Phoenix Lords would all die, for instance. The concept of shaking up the existing narrative, unifying races and coining/copyrighting/trademarking new names for existing races all seems very familiar. This might not necessarily be heralding an "Age of Sigmar"-esque shake-up/reinvention of WH40K, but it's easy to draw the parallels. The success of the Horus Heresy (i.e. WH30K) range and the huge gaps in the existing timeline shows that there is ample opportunity to tell new stories in the WH40K universe without having to tear things up and rush towards an endgame all of a sudden. I don't know what the future holds, but for now I'll be concentrating on my beloved Craftworld Eldar, circa 999.M41. After all that rambling, there's also an update to the runes & symbols guide. I'd hope to have this model undercoated before I added it to the site, but with cold, damp weather now prevalent this seems unlikely to happen for some time. So without further ado, I present the Eldar Panther; a kitbash of a Lynx and a Falcon. It doesn't have any rules at the moment as it's more of a modelling project than anything. For such a deceptively simple conversion, it took a lot of work, though it was actually completed several months ago. I hope that you like it - I'm happy with how it's turned out and I hope to have it (and a whole load more models) undercoated once the weather improves in the spring. I've yet to decide on a design for its rune. I've also assembled the new, plastic Eldrad Ulthran, which is a fantastic model. I've been working on my Harlequins too; the Solitaire has been assembled with some minor conversion work and more models are in the process of being constructed. On a personal note, the arrival of our second child has naturally reduced my free time (and is part of the reason I didn't manage to paint a single model in 2016), so site updates will be less frequent for the time being. I will continue to work on my collection when I get the chance and I have a large update planned for the runes & symbols guide as well. Just a minor update today; I've added some photos of my Wraithknight with the various available weapon options, now that it has been undercoated. I'm hoping to get some more models undercoated before autumn properly arrives, including the kitbash project that I alluded to previously. I've also assembled the new Eldrad miniature and a Harlequin Solitaire; I'll add pictures of both in due course. I've decided to abandon my conversion of Eldrad Ulthran, now that a new plastic kit has arrived (which is very exciting!). I've also finished my conversion of Fuegan. I'd attempted a conversion before but ultimately wasn't happy with it so started again from scratch. Also, with some excellent weather a few weeks ago I was finally able to undercoat a large number of models. Some of these had been waiting several months, so I'm really pleased to have these ready to paint now. This is a fantastic resource and I will be poring over it for further inspiration for some time to come, I'm sure. 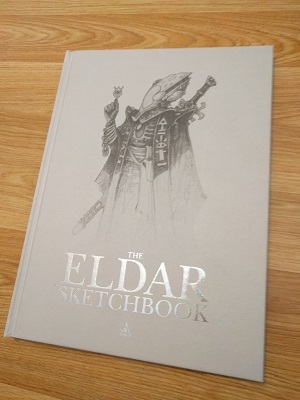 I'd urge all Eldar collectors to head down to their local store on its anniversary to get a copy. It is not comprehensive (no Dark Eldar, Harlequins, Titans, Warp Spiders, Shining Spears or Battlefleet Gothic ships, to name a few omissions). But there is still a lot of stuff in there and it is well worth the �30 asking price. After several months of occasional attention, I have finally finished assembling my three Wave Serpents. These required a lot of gap-filling, especially around the resin components. I'm very pleased to have these done at last! I've made progress on a number of other things as well. I decided to complete the turret from my abandoned Eagle as a standalone turret for a Farseer Falcon; this is now ready to be painted. Another abandoned project for an alternative design of Night Spinner turret has also been completed and I now intend to paint this at some point as well. Before the updated, combined plastic Fire Prism/Night Spinner turret was released a few years back, I had planned to make some Fire Prisms turrets using the Type II Falcon upgrade kits from Forge World. I still really like the classic Fire Prism turret design, so I decided to make one of these for a further bit of variety in my collection. I've added photos of a selection of my 30 Guardian Defenders, which are waiting to be undercoated. I've also added a new Autarch and Prince Yriel to my collection. The flying base for the Pegasus is nearly complete and the scenic base for my Wraithsinger is ready for undercoating. Lastly, I'm currently working on a kitbash project that I'd been mulling for a few years; this will probably serve as the last major modelling project for the collection (until I think of something else, of course....). It will be added to the site in the fullness of time - watch this space. I have been steadily working on assembling three Wave Serpents, having acquired the (now extremely rare) Forge World Type II conversion kits necessary to assemble them to my liking. Unfortunately, progressing work on my Eldar collection has had to take a necessary backseat recently due to work and family commitments. This is likely to mean that there won't be many updates on the site over the next few months, though I will be able to respond to comments and e-mails. I'm still very keen to get the Pegasus painted in 2016 and to assemble the last remaining models awaiting my attention, but this will have to wait for the time being. I'm now entering the "final" stages of assembling and undercoating my collection. I have 30 Guardians (not yet added to the site), 10 Jetbikes and a Phoenix Lord (Jain Zar) that are awaiting undercoating. In terms of remaining models needing assembly, I have some Harlequins, an Autarch, a Crimson Hunter (this will be magnetised so it can be fielded as an Exarch as well), Prince Yriel, Eldrad Ulthran and a conversion of Fuegan to complete. That's then basically my entire collection ready for painting (in theory). Sounds simple enough! I'm sure I'll continue to add the occasional new model, but it will be nice to have finally reached a stage where I've cleared my backlog of partially-assembled kits and can focus more on painting. I also have some vague ideas about sculpting some unique models from scratch, but that's a bit of a pipedream right now! After much experimentation and several late evenings, I'm delighted to announce that I've finished painting my first Shadow Spectre. The colour scheme has turned out better than I'd expected and I'm delighted with the results. The rest of the squad, their Exarch and their Phoenix Lord are paritually painted and I hope to finish them before the end of the year. The first of my three Falcons has now been painted. This has also enabled me to update the Warp Hunter page, since the different weapon options based on the Falcon chassis are magnetised and interchangeable. Furthermore, after several weeks of steady progress, I have finished assembling all of my jetbikes; six Windrider Jetbikes, three Warlock Skyrunners and a converted Farseer Skyrunner. I've been waiting for these new jetbike models for years, ever since I saw the prototype model at Games Day 2007 and they are fantastic models. I'm now painting my Shadow Spectres, along with their Exarch and Phoenix Lord. I'm very excited about the colour scheme that I've picked for them and they're progressing nicely. I should have photos of the completed miniatures up on the site within the next few weeks. I've finished painting the detailed scenic base for the Hemlock Wraithfighter, which means that the whole project is now totally finished. I've also assembled and undercoated my fourth and final squad of Wraithguard/Wraithblades - these are armed with D-scythes. The fantastic weather has meant that I have recently been able to undercoat a number of my assembled projects. First and foremost, the Pegasus is now undercoated and I'm extremely pleased with the result, with very few imperfections or transitions between different components visible. I've also undercoated the Lynx (and its scenic base), the base for the Falcon (which in fact has also been painted), my Dark Reapers and their Exarch, my three new Farseers, my Vypers, my Communication array objective marker/scenery and my solitary Vaul's Wrath Support Battery platform, which I've not displayed on the site before. Some scenic bases, magnetised weapons and 11 pilots are ready for painting now too. My pair of converted Vypers are now assembled and waiting to be undercoated. I've also assembled a further two Farseers, completed the base for the Lynx and one of my Falcons and finally finished my conversion of the Phoenix Lord Jain Zar. Storm Guardians - too similar to Guardian Defenders and I'm not a fan of the dated models. Warp Spiders - dated sculpts and limited conversion potential; waiting on new models. Shining Spears - ditto, although it may be possible to convert these using the new Windrider models. Autarch Skyrunner - ditto, though the conversion opportunities are obvious, so I may add one at some point in the future. Corsairs - I'm not a big fan of the Corsair jet packs and their rules are sorely in need of an update. Wasp Assault Walker - A nice model, but I already have three War Walkers and they're not different enough to warrant inclusion. Forge World Avatar - It's good and a much more appropriate scale than the standard Avatar model, but I don't want to convert another one and I'm pleased with the one that I have. Nightwing - I'm not a fan of the model from Forge World and my attempt to convert something didn't go as well as I would have liked. Phoenix Bomber - It's OK, but I had a Void Dragon Phoenix and just couldn't get to a point where I was happy with the model. Cobra - Too similar to the Scorpion to justify the cost. Revenant Titan - a fantastic model, but I have nowhere to store one and the Wraightknight is nearly as big anyway. Phantom Titan - an incredible model, but I can't justify the absurdly high cost or the space it would take up. Vampire Raider/Hunter - I really like this model, but it would be extremely impractical to store. Harlequin Skyweavers - The models are OK but I'm much more keen on the Windrider Jetbikes. Harlequin Starweaver/Voidweaver - Again, a nice model but I don't plan on adding any as it's very similar to the Vyper. Dark Eldar - Although I have Harlequin models, I don't intend to add any Dark Eldar to my collection. Many of the models are excellent, but I'm not as keen on the background for them and prefer my Eldar to be enigmatic and inscrutable rather than outright evil. Of course, all of the above is subject to change at a moment's notice, but for now I'm very happy with the collection that I've amassed and I have enough new models to assemble for at least a year or two. I'm focusing more and more on getting things painted, which is an even slower process. It's ultimately rewarding though and I'd love to have enough miniatures painted to be able to field a completely painted force for a game someday soon. I completed assembly of the Pegasus on 11th June 2015; over four years after I first started to work on it. I will now focus on painting it and completing its two scenic bases. As part of the flying base I'm including a removable a statue of Asuryan and his winged steed, which can also be used as a standalone piece of scenery or an objective marker. Whilst I've mostly been focusing on the Pegasus, I've also progressed a number of other small projects. I've altered one of my Shadowseers, replacing the Harlequin's Kiss arm with one holding a Neuro-disruptor due to the changes to the permitted wargear in the new Harlequin codex; I've finished assembling my Dark Reapers and their Exarch and I've put together a female Farseer using the plastic kit from the previous codex release. I've also progressed the assembly of my pair of converted Vypers and continued to work on painting my first Falcon, which is nearly finished now. The excellent weather over the Easter weekend allowed me to undercoat a whole load of models that I finished assembling and converting. This includes my Rangers, Alaitoc Pathfinders, Illic Nightspear, the base for the Hemlock Wraithfighter, Striking Scorpions, Striking Scorpion Exarchs and the Wraithsinger. The new Craftworld Eldar releases look fantastic - I can't wait to add some Windrider Jetbikes to my collection after waiting so long for them to be released! My collection is now approaching its final composition - there are only a handful of unit types left that I want to include and with the vast majority of my stuff assembled and undercoated (and some even painted), things are going nicely. The Pegasus has been receiving some long-overdue attention. I've come up with a colour scheme for it that I'm happy with, I've started painting some of the component pieces and it has some new weapon options too. Ideas are beginning to come together for the interior detail and I've been working on various bits of gap-filling and other finishing touches on the exterior. I've also finalised the rune for it (see above left). The only model that I've bought this year (so far...) is a Lynx armed with a Sonic Lance. It's a great kit and I've been meaning to add one to the collection for a while now. I've made some progress with it alongside my work on the Pegasus and expect to have it fully assembled soon. I won't be magnetising the main gun as I don't have a Pulsar to swap the Sonic Lance for (though the secondary weapon mount is magnetised). I've now finished painting my magnetised Warp Hunter cannon; more pictures will follow once I've finished painting one of my Falcon hulls to go with it. I plan to add some of the new Harlequin models at some point this year, but I'll likely "limit" myself to one of each of the three new character models and a single Starweaver and box of Troupers. The Skyweavers and Voidweaver don't really appeal and I don't want to add too many Troupers when I already have a couple of dozen. Further Starweavers down the line might be a possibility but I already have so much to paint, I don't want to make things unnecessarily harder.... The new Craftworld Eldar models that are in the pipeline are very tempting. I've been holding off buying jetbikes for years; ever since I saw the prototype at Games Day 2007 and talked to Jes about them. It's taken a while, but my Ranger and Alaitoc Pathfinder squads are now fully assembled, with 10 squad members in each. I've also finished the scenic base for Illic Nightspear, which marks another batch of models ready to be undercoated. The weather is starting to improve now, so hopefully it won't be too long before I can get outside and break out the spray paints. I've reorganised the Eldar runes & symbols guide, breaking it down into further sub-categories to make it easier to browse. The various new Harlequin runes are now included as well. Right now I'm working on assembling a Forge World Lynx with Sonic Lance (pictures to follow), whilst on my painting table is one of my Falcons and the magnetised Warp Hunter gun. Once those are complete, I intend to turn my attention back to the centrepiece of my collection, the Pegasus, and finally complete its assembly, ready for some ambitious (and time-consuming) painting. Watch this space! My War Walkers have had some attention - I've changed the way that the magnetised weapons attach to them, so they now use the same weapons as the Falcons etc. and look a bit more like the Wasp Assault Walkers from Forge World (which are nice models, but I don't have any plans to add them to my collection). I've added photos of the additional conversions that I've completed so far for my Ranger and Alaitoc Pathfinder squads, which are both nearly at full fighting strength of 10 per squad. I've been downsizing my collection a bit of late. I've decided to stop working on my alternative Night Spinner turret and the War Walker squadron commander. Neither of these really fit in with the rest of the army now. If anybody would like to purchase them, please e-mail me and I'll consider offers for them. I am planning a substantial update and overhaul of the Eldar runes & symbols guide once I've got a copy of the Harlequin codex, so watch this space. In anticipation of the new miniatures, I've been working on a Death Jester conversion, which is now virtually complete. I've also added some new photos of the scenic base for Illic Nightspear, which is nearly finished now. The Death Jester conversion has been distracting me from my current project, which is to finish the last members of my Ranger and Alaitoc Pathfinder squads, taking both up to a total of 10. That's proceeding well, with only a few left to finish now. I'm delighted to present my first fully-painted Hornet, complete with Pulse Lasers and scenic base. Obviously there are a lot of other weapon options that I've yet to paint as well! This is my first grav tank and I'm hoping to follow this up with one of my three Falcon hulls and my Warp Hunter turret. I've also finished assembling the remainder of my Striking Scorpion squad and the last two (of four) Striking Scorpion Exarchs, so now I can field a full squad and choose from all of the available Exarch wargear options. The scenic base for my Hemlock Wraithfighter is ready for undercoating as well. I undercoat my miniatures outside, so I'm waiting for better weather before I can get these new additions (and my four Autarchs) sprayed and get my "miniatures assembled & undercoated" count for 2015 off to a flying start! ... and probably some other projects that catch my attention! I hope that you all have a great year and thank you for continuing to follow my little site - I hope it provides you with some ideas and you find my projects interesting. I've been working on several smaller projects recently and I'm happy to say that I've finished converting and assembling all four of my Autarchs, which have been at various stages of completion for some time now. They probably won't be undercoated until the spring, now that the weather has turned cold and wet and I imagine they'll be joined by a number of other assembled miniatures that I plan to complete through the winter months. One of the other things I've assembled is a piece of scenery in the form of a communications array. I have plans for a few other bits and pieces like this too. I'm also making progress on the detailed scenic base for my Hemlock Wraithfighter and I've made some changes to my conversion of Eldrad Ulthran to give him more presence compared to the other Farseer models. More excitingly, I've painted my first Striking Scorpion. The colour scheme is a little different from what I'd originally planned but I'm happier with the end result. My current aim is to paint a single test miniature for each type of infantry, vehicle etc. I'm not sure what I will paint next but I'd love to get one of the beautiful Hornets finished, so that might be my next goal. I've finally made a start on my working with plasticard guide, which contains a brief overview of some of the techniques that I use. There's also an embedded YouTube video showing how I make the panel lines that so many people have been asking about. I hope the article and the video are inforamtive, I will try to add some more detail in future but really these techniques aren't difficult, so there's not a huge amount else to add! The best thing to do is buy some plasticard and experiment with it. I've finished painting my first Fire Dragon and I'm pleased with the results. The molten metal on the wreckage on the base has turned out better than I'd hoped (though it did take a couple of attempts to get it right). This is an important painting milestone for me, as these colours and techniques will prove useful when I get around to painting the Avatar. I've also started to photograph my completed miniatures against a dark background as it gives a truer representation of the colours - I have gone back and replaced the existing photographs of my finished miniatures with new ones too. After a lengthy construction, my converted Wraithknight has been undercoated and is ready for painting (barring some minor gap filling and tidying up). I've been working on my two large centrepiece projects for the past few months, as I really want to get them completed. I'm pleased to report that the Wraithknight is now ready to be undercoated after applying some final finishing touches to it. The Pegasus has received a lot of my attention, although the photos don't really reflect that. I've spent a lot of time cleaning it up, neatening areas, filling gaps and correcting small problems and imperfections. One half of the scratchbuilt anti-grav vanes are now finished - I'm really happy with how they've turned out, but they have taken a long time to finish (and I'm still only halfway overall....). The interior is still a work-in-progress and I've spent/wasted a reasonable amount of time on some ideas for it that ultimately didn't work out. Happily, I'm now closer to finalising my ideas, as this is the last major part of the vehicle that needs my attention. I've also decided that the removable upper hull will be glued in place eventually. The interior will still be visible through the magnetised rear access hatch; although this is more limited than being able to take the roof off and look inside, I feel that the gap around the removable roof distracts from the surrounding panel lines and spoils the look of the exterior, which is arguably the more important (and most visible) part of the design. The interior will be fully detailed and painted first and I'll take some close-up photos of it before I stick the roof down though. I've added a new page for a pair of Vypers that I'm converting using the Dark Eldar Venom as a base. This project has been on my to-do list ever since the Venom was released. I've been steadily working on several projects for the past few months and have now reached the point where they are all undercoated and ready for painting. I've also tidied up the project logs throughout the site so that they should now better reflect the current state of my collection. My conversion of the Phoenix Lord Baharroth has been reworked and Asurmen and Irillyth are complete too. Jain Zar and Fuegan remain the only unfinished Phoenix Lords (I have started a new conversion of Fuegan after I was dissatisfied with my first effort). My interpretation of the Mymearan Farseer Bel-Annath is finally finished following the addition of some detailed sculpting. I've also added a new page for Illic Nightspear and his converted scenic base. I've updated the photos of my Warlocks and split them into two project pages - one for those armed with witchblades (including a new, extensive conversion of one miniature) and one for those with singing spears. I've converted a third Harlequin Troupe Master, as well as another four Harlequins and a further four Harlequins with Harlequin's Kisses. Several of my Howling Banshees have been re-based and that squad is now fully undercoated and ready for painting as well. I've replaced the photos of my Guardians - I will be assembling more of these as I recently discovered that I have enough spare parts for at least another couple of dozen, plus two more heavy weapon platforms. The last change to my infantry is also an important milestone - the completion of my first squad of 10 Dire Avengers. I have a second squad of 10 to paint (and the Exarchs), but I'm still really pleased to have finished my first squad. I've made progress on my vehicles too. The first of my three Falcon hulls is now waiting to be painted, I've undercoated my Hornet squadron and the Warp Hunter turret. The Fire Prism turrets have also been updated - the crystals are now a deep purple to match the canopies and I think that the effect looks quite striking. With a 3-month old baby, I'm counting myself extremely lucky that I've been able to continue to work on my collection, although finding time to paint is tricky. I'm happy to report that the vast majority of my collection is now assembled and undercoated. I still have quite a few things that require more work, but it's looking like a much more manageable number now. I'm starting to think that maybe, just maybe, this will someday all be painted as well! I'm not rushing to buy the new 7th edition rulebook just yet though as I'm ambivalent about some of the changes and the direction of the game in general. In the meantime I'll continue to enjoy assembling and painting my miniatures. It's taken me almost 4 years to get to this point, but my Scorpion superheavy grav tank is now undercoated and ready to be painted. Several more vehicles will be undercoated soon and I'm working on colour schemes for many of the Craftworld units. With work on my conversion of the Wraithknight nearly complete, I have assembled it to see what it will look like. The custom warp vanes have turned out better than I could have hoped and give it a suitably imposing silhouette. I will be able to undercoat the many component pieces soon - painting it will have to wait until I have created a template for it and experimented with some colour schemes in Photoshop. My first Eldar vehicle has been completed - the Hemlock Wraithfighter. I am really pleased with the colour scheme and the subtle conversion to change the angle of the wings has given it a much more aggressive profile. I am working on a scenic base for it and hope to have that painted soon as well. Some more photos of the Wraithknight have been uploaded, including a work-in-progress image of the scenic base. The Wraithknight can now be assembled (but still breaks down into component pieces, for ease of painting). This has allowed me to finalise its pose and get an idea of how it will look when it's finished. I've decided to stop working on several older Eldar projects, which have been relocated to this page for posterity. Sometimes I lose enthusiasm for a project; sometimes they just don't ever seem to quite work somehow. Rest assured, the Pegasus will never fall into that category! I'm just working out how to do the interior, with various ideas that I want to consider. I've also updated the Eldar runes and symbols guide. Work on the Wraithknight continues - I'm making steady progress with it and its starting to come together. The four sets of warp vanes will require a lot of work and I may end up making one set and having the others cast from resin so that they all match. I'll cross that bridge when I come to it! New paint scheme templates have been added for the four varieties of Wraithguard/Wraithblades. I have assembled a squad of Wraithblades with Ghostswords and purchased my fourth (and final) box so I can put together a squad of Wraithguard with D-scythes. Although I could theoretically expand each squad to a full complement of 10, I think 20 Wraithguard is plenty and I have each of the codex options covered. The Hemlock Wraithfighter has been assembled, with just the scenic base and Mindshock Pod left to put together. I plan to paint this soon and I've already painted the dorsal fin separately and applied transfers to it. I have also finally purchased a Wraithknight and I've been working on this project a lot in the past few weeks. There is still a lot of work to do, but my progress is good so far. Due to the amount of changes that I'm planning, most of the major components in the upper body require some converting. The legs will need less work. I have completed my eighth miniature - the Heavy Weapons Platform for my Guardian Defenders. Although it's not a particularly special miniature, it's an important milestone for me as it's the first thing that I've painted in Craftworld colours. I've created a colour scheme based around mostly white areas with two shades of blue. Most of the gemstones and spiritstones will be a deep red. I'm really pleased with how it's turned out and the vibrancy of the white especially. I had originally planned to use snow and ice bases, but I've opted instead for grasslands and I'm surprised at how well the colours work together. Obviously the Eldar aren't camouflaged in the least, but I'm more interested in bold, vibrant colours than anything realistic. I hope that you like the colours - the design of the Heavy Weapons Platform means that I can easily extrapolate the colour scheme to Support Weapon Platforms, Hornets, Falcons and even the superheavy Scorpion and Pegasus. I am also going to make extensive (but not excessive) use of transfers - each Aspect will have their rune on their right kneepad and the vehicles will have a variety of warning emblems and iconography. Any banner designs will probably be created with a mixture of transfers and possibly some freehand work. I've reorganised the website - all of my Eldar collection is now in a single section, reflecting my decision to simply it. The Harlequins and Outcasts are now found under the single "Eldar" section above. I have removed some older projects that I am no longer pursuing and have either sold or ditched because I wasn't happy with how they turned out. I have added several projects that I've been working on for a while - a squadron of Hornets, a Hemlock Wraithfighter (with re-angled wings), Wraithblades with Ghostaxes, Wraithguard with Wraithcannons and a Spiritseer. I've also put up a placeholder page for a planned Wraithknight conversion too, which shows my concept for the redesign. I now have four Autarchs too; two of which are female and one has Shadow Spectre equipment. After a lot of work and some trial-and-error, I have now finished seven of my twenty Dire Avengers; they have been painted, had transfers applied, been varnished and based. This is a major milestone for me! I have also finalised my craftworld colour scheme, which I will reveal soon. In a major change, I've added a Disqus comments section to most of the site. I considered importing all of the site content onto a hosted blog platform, but ultimately that was far too much work and would mean sacrificing a lot of the site's design and features. I hope that you find the comments section useful and I welcome your feedback and questions about my work. My most recent commission, an Eldar Corsair Void Dreamer, has been added to the site. Lastly, due to personal circumstances (read: imminent parenthood) I have to announce that I am no longer accepting commissions for conversion projects, though I will continue to work on my personal collection and I'm always happy to offer advice to other hobbyists. I have converted several miniatures in my collection to better represent the gender equality in the Eldar forces. This is a unique feature of the Eldar race in the Warhammer 40,000 universe (where women are woefully under-represented, or absent entirely), though it is poorly reflected in the Eldar miniatures that are currently available. To that end, I have converted a female Dire Avenger Exarch, Fire Dragon and Striking Scorpion (and a male Howling Banshee). I also have a female Farseer conversion in the works and the Spiritseer pilot of my Hemlock Wraithfighter will be a woman as well. I am however still a long way off being able to reflect the statement in the new codex that Eldar Aspect Warriors "are equally likely to be male or female". My first painted miniature, a Dire Avenger, is now nearly finished and the other 9 members of the squad are next in line. I've also (mostly) finished painting my first Fire Dragon. I've managed to make some good progress on several older projects too, in my ongoing quest to actually complete things. Eldrad Ulthran is nearly complete (barring some work on the base), my 5th Wraithlord is now ready to be painted and my Striking Scorpion Wraithlord conversion is assembled. I've also put together a shiny new Wraithseer from Forge World. I've added a stats counter to the frontpage (see right) to track my progress and (hopefully) act as a motivator to continue to complete projects and get things painted. I'll only consider a miniature painted/completed when it has had transfers applied, been varnished and based, so currently I'm still on zero! The Wraithsinger is virtually complete now, with just the base left to do. I've been working hard on multiple projects lately; the new Eldar releases have been a good excuse to try and finish more of my existing collection. I've even picked up a paintbrush for a second time and almost completed my first Dire Avenger (photos to follow). Overall, I'm pleased with the new Eldar kits, although the absence of new jetbikes is ridiculous, the repackaging of the Dire Avengers ("5 for the price of 10! Buy now! Beat the rush!") nothing more than shameless greed and the Wraithknight has a lot of design issues. 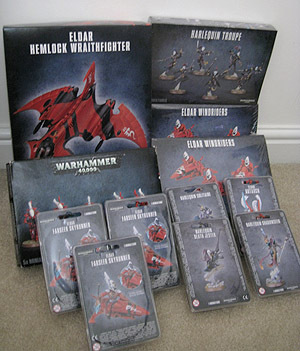 Still, it's a good time to be an Eldar collector. The Eldar runes and symbols guide has also been updated with some of the new designs and substantially reorganised. This project has been receiving most of my attention recently. The Wraithsinger is a wraith construct that is taller even than a Wraithlord. It has been animated by the soul of a powerful Bonesinger and its design deliberately takes several cues from that miniature. I hope that you like it. I am awaiting with anticipation (and some trepidation) the release of the new Eldar codex and miniatures, which are rumoured to be arriving in June. If the new miniatures are well-designed and interesting to me, I will probably buy them, but I anticipate that this will be my last big Eldar purchase for the foreseeable future. Games Workshop as a company have been making a series of disappointing and harmful decisions over the past few years, which have becoming increasingly difficult to ignore. I find myself now in a position where I no longer feel comfortable supporting them as a company. I have no immediate plans to purchase any more GW miniatures (and the rumoured Eldar codex is going to have to be very special indeed to even come close to justifying the standard codex RRP of �30). I will complete the Pegasus some day. In fact, I hope to eventually have all of my collection completed and painted. I anticipate that this will take a long time (probably years) to achieve, so this site will continue to be updated periodically with my progress. I should also mention that I have several projects that I have yet to publish, which will be uploaded soon - a Hornet squadron, Wraithseer and a Wraithsinger (that is *not* a typo, and it is one of my favourite conversions to date), as well as additional squad members for several units. Listed below are the questionable decisions that GW have made that have led me to this decision. If you too are suffering from "GW fatigue", the only thing you can do is vote with your wallet, as GW certainly isn't listening to our voices. The introduction of Finecast as an improvment over white metal (whilst being plagued with casting/QC issues) and as a means to lower costs (leading to ridiculous prices for the customer). Absurd price increases of up to 67%; especially brazen in a time of global recession. Charging �30 for a brand new Codex that requires 2 pages of errata on release. Digital publications that cost the same as their paper versions. Massively over-charging for hobby supplies; because they can get away with it (compare 6" of Green Stuff from GW and 36" direct from Kneadatite's preferred supplier). Limiting information on upcoming releases to a 1-week window due to The Hobbit license, making long-term purchase planning impossible. Sitting on redesigned Eldar jetbikes since 2010 and continuing to charge �8 for a design that is nearly 20 years old. New (and extremely restrictive) trading terms for 3rd-party retailers, designed to eliminate competition and bring all orders in-house. Massive (and totally unjustified) price discrepancies in foreign markets (particularly Australia). Over-reaching defence of its Intellectual Property (most egregiously in this example). Inability to deal with criticism from its customers (following the above). Game-breaking rules and massive balance issues, mostly authored by Matt Ward. An increasing tendency towards bad miniature design. Forge World charging for a formerly free event under the pretence of "managing numbers" (anticipate that the cost will increase in 2014 and that the queue for the sales counter will be as bad as ever). Forge World setting outrageous prices for the new Horus Heresy range, knowing full well that the demand will ensure that people buy it regardless. * NB - possibly the most sensible decision GW has made recently was to allow the not-for-profit Lord Inquisitor movie to continue. It was a no-brainer of course, since it is probably the most faithful recreation of GW IP ever seen, costs them nothing and looks awesome; but that hasn't stopped GW from cutting off its nose to spite its face before. I hope that GW is able to reinvent itself and starting caring about its customers again, but right now all I can see is a lack of honesty and transparency, coupled with extreme short-shortsightedness and greed. My personal feeling is that most of these decisions have been made because GW is a publicly-traded company and they are desperately afraid of doing anything that might upset their shareholders. I wouldn't be surprised to see a large drop in the share price over the next few years, unless GW makes some root-and-branch changes. It's been a while since I updated the site, but I've been very busy in the meantime. My collection is becoming more refined now and I'm completing more and more of my unfinished conversions. In a shocking development, I've even picked up a paintbrush and started painting my Dire Avengers! I've only basecoated one miniature (and started on 9 others), but it's a start at least and I'm pleased with the early results. I've now split my Eldar Harlequins into two squads - standard Harlequins and those armed with Harlequin's Kisses. I've added pages for several new additions too - a squad of Dark Reapers and their Exarch, a converted Phoenix bomber, the first of three planned Warp Hunter turrets and a squad of the beautiful Shadow Spectres. There are also new photos of my War Walkers squadron and an update for my Farseer. I've updated my Pegasus project log and the Apocalypse datasheet, with rules, background and a technical diagram of the Pegasus, is now online too. In preparation for a large Apocalypse battle, I've been working flat-out to assemble Irillyth; the Shadow Spectre Phoenix Lord. I've also completed conversions of all of the other Phoenix Lords - Asurmen, Karandras, Jain Zar, Fuegan, Baharroth and Maugan Ra. I've also made conversions of the Farseers Eldrad Ulthran and Bel-Annath, the warlike Farseer of Mymeara - currently the only Eldar Farseer with access to the Pyromancy discipline of psychic powers. Lastly, I've added the remaining runes from Imperial Armour 11: The Doom of Mymeara to my Eldar runes and symbols guide. There are lots of other minor changes and updates throughout the site. The Eldar runes and symbols guide has been updated with around 40 of the cursive runes seen in the background of the pages of Imperial Armour 11: The Doom of Mymeara. I will add the remaining 20 or so runes soon. New photos of my Fire Prism turrets have been added too, as well as a new photo of my first undercoated Pathfinder. My converted Shadowseer has been re-armed with a Harlequin's Kiss and I've also designed and sculpted a new scenic base for my Avatar, which looks much, much better than my first attempt and really finishes the miniature off well. As you can see, I've finally finished the redesign of the site. In the end, integrating a comments section or migrating the existing site content to a blog platform would have been very difficult and time-consuming, so just consider this site a blog with the comments disabled! The site has been expanded considerably in terms of content, though it (and my collection) is now more tightly focused on the Craftworld Eldar. By focusing my attention, I intend to actually finish some conversions and get some stuff painted. I will soon be adding a new conversion guide detailing techniques for working with plasticard, but in the meantime I've added a new section on Eldar runes and symbols and made my personal Eldar paint scheme templates available for download too. My (supposedly) last major conversion project, the Pegasus, continues to go well. I aim to have it fully built (though almost certainly not painted) in time for the 2013 Forge World Open Day. In the meantime, I've been revisiting some of my Phoenix Lord conversions in order to make them fit in better with the modern styling (and scale) of the Eldar miniatures. To that end, I've done some additional conversion work on Asurmen, Jain Zar and Fuegan (and I've also started a brand new conversion of Karandras, which I will add soon). My Striking Scorpion Exarch Wraithlord is progressing well, I've almost completed my second Fire Prism turret (of three) and I've also started converting a squad of Pathfinders. Finally, I'm also working on a new Autarch conversion, which I'm very pleased with indeed. Most excitingly, I've actually begun undercoating some of my collection, which obviously paves the way for actually painting at some point in the slightly-less-distant-than-before future! I'm experimenting with paint schemes for my Craftworld at the moment, though I do know that the miniatures will mostly be on snow-themed bases. That's all for now - this site will continue to be regularly updated with my progress, so do please keep visiting. Happy New Year to you all! The Pegasus was a little neglected over the Christmas period, but progress has been made nonetheless and I'm confident that I'll finish it before 2013 rolls around. My other goal for 2012 is to streamline my collection a bit. To that end, I'm planning to sell off a few of my conversions in the coming weeks and focus my collection almost entirely on Craftworld Eldar. In light of this, I'm also planning a fairly major redesign of this site, which may or may not include a move to a more blog-like format with a comments section. Setting up a blog is easy enough, but integrating my "tags" and keeping the site structure broadly the same might cause an issue. We'll just wait and see how I get on with it, I guess! Work on my scratchbuilt superheavy transport, the Pegasus, continues apace - the upper hull is almost finished (hooray!) and the underside isn't far behind (with the obvious exception of the anti-grav vanes, which I still need to get laser-cut...). Some more photos have been added to the Pegasus project log. The underside is coming along very well and the port side of the vehicle is more-or-less finished. Work on the starboard side will commence soon. Some more photos have been added to the Pegasus project page. The Pegasus is coming along nicely, so I've added some more photos to the project page. The Pegasus is a scratchbuilt superheavy transport, based on a vehicle from a piece of artwork of the Lugganath Craftworld in the latest Warhammer 40,000 rulebook. This will be my last new project for a while - once its finished, I'm going to try and aactually finish my many other half-finished projects and maybe even get some things painted! I've just completed a scratchbuilt Nightwing (it's not painted, of course - but that counts as "complete" in my book at the moment!). I'd previously attempted this project but it didn't go very well. Fortunately my latest effort didn't suffer from the same problems and I'm very pleased with how it's turned out. I've revised the rules for the Eldar Eagle; the points cost has been dramatically reduced and the way that the psychic relays work has been changed slightly. I'll be adding some more new photos of some of my projects to the website soon. I've recently completed a subtle conversion of the new plastic Fire Prism/Night Spinner turret. The new design struck me as looking a bit odd somehow, but after playing around with the kit a bit I've come up with a slightly different version that I'm happier with. As usual, it's been magnetised too. I'd be interested to know your thoughts on this and if you think it's an improvement (or if the difference is only noticeable to me!). It's been a while since I've updated the site, but rest assured I'm still working on my collection and intend to start painting some of my miniatures this year (hopefully!). Today I've updated many parts of the site; there are updates for my conversions of Jain Zar, the Falcons, Firestorm turrets, Exodite Dragon Knights and the Eagle. I've also added some new conversions - a heavily-customised Forge World Night Spinner turret, a Type II Scorpion and two new Wraithlord conversions that I've started working on. I've also decided to abandon my Nightwing conversion, though I do still want to have another crack at converting my own at some point. Finally, I've also added some work-in-progress shots of a minor conversion of the Games Day 2007 Orc Boss, which I've been inspired to work on following the release of the latest edition of Warhammer. I recently completed an unuaul commissioned conversion of a Farseer Wraith, pictures of which have now been uploaded. I've also added photos of another Ranger; the 1st squad is almost ready for undercoating and I've started work on a 2nd squad, which will have feature several conversions (pictures will be uploaded soon). Keep an eye out as well for pictures of a Forge World Night Spinner conversion and work-in-progress shots detailing construction of my Forge World Type II Scorpion kit (possibly the most beautiful kit they make, in my opinion). I've added a page for a new conversion - my first Autarch - as well as new photos for Sevareil Focul and Drazhar. Lastly, I've added a new shot of the interior of the Eagle, which is coming along nicely. Expect more photos of this conversion soon, as I'm making a lot of headway with it. With rumours of (relatively) imminent new Dark Eldar releases abounding, I decided to convert one of my favouite miniatures from the old range - Drazhar, the Master of Blades. I'm holding off buying Dark Eldar in any meaningful numbers until the new range is (finally) released, as most of the sculpts are absolutely terrible. Drazhar however is an excellent miniature - one of my favouties in fact. I've finished uploading a number of new bits and bobs to the site. I've added some photos of my first commissioned conversion, an Eldar Warp Hunter, and pictures of some recent Eldar Exodite Dragon Knight conversions along with some background information for them. I've also updated the Eldar Pirates section with some new conversions and written some background information for them too. Finally, I've now split up all of the squads so that each squad has its own page, so there are 5 pages for my Dire Avengers for example. Expect to see even more new content in the coming year - you never know, I may even get something painted! I've uploaded some additional photos of my Falcons and added a new page for my Wave Serpents as well. I will be updating the magnet conversion guide soon to include more information about magnetising the Wave Serpent. There are also a few more pictures of both Harlequin squads. This is the first update since I launched this new, dedicated site for my Eldar miniatures and I hope that you like it! Firstly, I've added photos of a new conversion; a War Walker squadron commander named Sevareil Focul. Expect to see some rules for this new Eldar character soon. Back by popular demand, I've uploaded a new version of my magnet conversion guide for Eldar vehicles and lastly, I've also uploaded an Apocalypse datasheet for my popular Eldar Eagle conversion; I'd love to get your feedback if you try these rules out in a game! Welcome to my new spin-off site, dedicated to my Eldar miniatures collection. I've decided to put this site together to collect photos of the various conversions I've done and present information on how I've put them together. I've received a lot of positive comments from other collectors regarding my work so I'm hoping that this new site will be of interest to other Eldar fans out there. My main site, arhicks.co.uk, is now solely for promoting and displaying my art, photography and freelance illustration work. You'll also find any Games Workshop related pieces of art there. I've just finished uploading a large number of new photos of my Eldar miniatures. I've started work on a number of new conversion projects and also progressed some of my existing ones. New images have been added to the Fire Dragons and Eldar Eagle pages and I've created new pages for my 3rd Wraithlord, War Walkers, Firestorm turrets and Void Dragon Phoenix. As ever, the pictures are accompanied by information about how I made the conversions. I've also started working on a small force of Void Dragons (Eldar Pirates), so expect to see some work-in-progress pictures of these soon. I've been working on my Eldar army again and have added new pictures to one of the Harlequin pages and added a new scratchbuild project - a new Eldar vehicle of my own design; the Eldar Eagle. Further images and detailed descriptions have been added to the Craftworld Eldar pages. I've added new images to the Fire Dragons page and added a new page for my Striking Scorpions.